If you've ever picked up a fairy tale collection with the word "complete" in the title, you'll know that there are a LOT of obscure fairy tales out there. And when I was researching my novel INTO THE WILD, I read a LOT of obscure fairy tales. Some of them were absolutely fabulous; some of them were absolutely bizarre. So when I started this blog, I decided I wanted to include a recurring segment where I tell you about some of the tales that I found. You know, kind of give them a day in the sun. OK, I know I haven't even said "once upon a time" yet, but we already have the First Thing I Love About This Story: the name. Molly Whuppie. Doesn't she just sound like that girl you knew in high school who looked totally demure in front of teachers but had this wild glint in her eye, the one you always wanted to hang out with on the weekend even though you seemed to get in trouble every time? Once upon a time, a man and a woman have too many children so they take their three youngest and leave them in the woods. First Thing I Hate About This Story: lousy family planning. I guess if the kids had had a nice home life, then there wouldn't be a fairy tale about them. But still... not kosher. The three girls wander and wander until they find a house. When they knock, a woman answers and says she can't help them because her husband's a giant and will kill them if he finds them. The girls beg, and the women relents. Naturally, the giant finds them and utters the traditional "fee, fi, fo, fum." At which point, the woman tells her husband, "Ye won't touch 'em, man." Thing I Love #2: the giant's wife. She stands up to her cannibalistic husband, and she has a fabulous accent. The giant invites them to stay the night and to sleep in the same bed as his three daughters. The youngest girl (whose name is Molly Whuppie) notices that before they all went to bed, the giant put straw ropes around her and her sisters' necks and gold chains around his daughters' necks. In most versions of the story, Molly is described as "very clever" for noticing the straw ropes. How unobservant would you have to be not to notice a giant putting a straw rope around your neck? Seriously, was this a common thing? You visit a house, someone puts a rope around your neck, and off you go to la-la land. Apparently, Molly's sisters took it in stride, which makes them Thing I Love #3: super-laid-back siblings. Once everyone falls asleep, Molly switches the straw ropes for the gold chains. During the night, the giant sneaks into the room, feels for the necks with straw, and then beats to death the three girls (his own daughters) with the gold chains. When the giant goes back to bed, Molly wakes her sisters, and they flee. Did I mention that the siblings were super laid-back? How could they sleep through that? Also, here is Thing I Hate #2: the giant's wife, who did nothing wrong, loses her three daughters. Not fair. The sisters run until they reach a king's house. Molly tells the king her story, and the king says, "Great job, but if you outwit the giant a second time by stealing the sword that hangs on the back of his bed, I'll give your eldest sister to my eldest son in marriage." So Molly goes back to the giant's house, sneaks in, waits for the giant to fall asleep, and steals the sword. He wakes and chases her. They run until they reach the "Bridge of One Hair," which she can cross and he can't. She yells to him, "Twice yet, carle, I'll come to Spain." Thing I Love #4: "twice yet, carle, I'll come to Spain." What the heck does that mean? No idea. But I love it. Think I'll start saying that. Next time a car cuts me off, I'm shaking my fist at the driver and shouting, "Twice yet, carle, I'll come to Spain." And the driver will yell back, "Who's Carl?" Next, the king tells her, "Great job, but if you outwit the giant again and steal the purse under the giant's pillow, your second sister will marry my second son." So Molly sneaks in, waits for the giant to fall asleep, and steals the purse. He wakes and chases her. They run to the bridge and she yells, "Once yet, carle, I'll come to Spain." Forgot to mention Thing I Love #5: Bridge of One Hair. What sort of engineer makes a bridge of one hair? And how is she able to cross it? And why doesn't the giant petition the town to have a sturdier bridge built? It can't be good for trade. Finally, the king says that Molly can marry his youngest son if she steals the giant's ring from his finger. So she sneaks in again... but this time, the giant wakes before she runs. He says, "Now I have you, mwah-ha-ha-ha! If you were me and I were you, what would you do to punish me?" To which Molly says, "I would put you in a sack with a cat, a dog, a needle, a thread, and a shears, and then I'd find the thickest stick I could and beat you to death." Is it just me or does Molly have a few psychological issues? The giant put Molly in a sack with all the items she mentioned and wanders off to find a nice stick. Molly says, "Oh, if ye saw what I see." And the giant's wife begs to be taken up into the sack so that she can see what Molly sees. Molly uses the shears to cut a hole in the sack, helps the giant's wife into the sack, and then sews the sack back up with the needle and thread. Molly then hides and waits. Serious psychological issues. If she has shears and can escape, why not just escape? Why torture the giant's wife? Think I Hate #3: Molly Whuppie is NOT a nice girl. The giant returns and begins to beat the sack. The giant's wife cries out, "It's me, man!" But the giant can't hear her over the cat and the dog. Molly then runs, and the giant chases her to the Bridge of One Hair. Molly escapes and shouts, "Never more, carle, will I come again to Spain." And then she marries the king's youngest son and never sees the giant again. And they all live happily ever after. 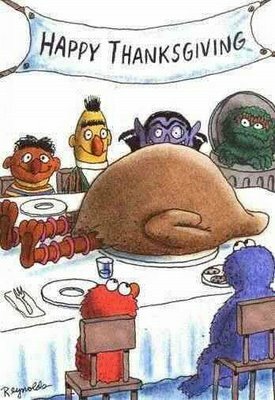 Happy Thanksgiving, everyone! May your travels be swift and your bellies be full. The Location: Society of Illustrators, a.k.a. cool Manhattan place with much cool art on the walls. The Invited Guests: Lots and lots of editors, agents, writers, and others associated with science fiction and fantasy publishing. And moi. The Outfit: Black skirt, black camisole, purple sheer-ish top (same color as my cover art -- I swear it was a coincidence), and my lucky INTO THE WILD bracelet (see WFC trip report). The Pre-Event Dinner: Sarabeth's. Love this restaurant, even though it's spelled without an "h". Best tomato soup ever. I also had baked brie. Yes, I ordered only appetizers. I have a thing for cute food. The Book I Read on the Train: WOLF CAPTURED by Jane Lindskold. 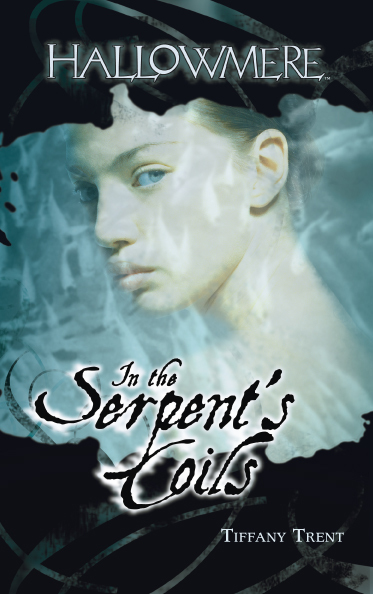 Best book of the Firekeeper series (which are my favorite human-raised-by-wolves books). Read it. Love it. Hug your inner wolf. Famous author: "Hi. Nice to meet you. How are you?" Important magazine editor: "Hi, Sarah. So what's new with you?" Influential book editor: "Where's the bathroom?" I like to think I was a bit more articulate than that, but I do have to admit that when I walked in through the door and saw the room was chockfull of editors and big-name authors and so forth, I froze like the cliched deer in headlights. The moment probably only lasted 30 seconds, but it felt like 30 minutes. I very nearly turned and bolted. But then Liesa Abrams (editor at Aladdin/S&S) rescued me -- thank you, Liesa! -- and from that point on I was milling and swilling like a pro. I talked to lots of cool people, including the fabulous Delia Sherman (author of THE CHANGELING, one of my favorite books of the year), the always-sweet Sean Fodera (contracts manager at Holtzbrinck and SF writer), the brilliant Ginjer Buchanan (editor at Ace), and the very cool and phenomenally-talented couple, Holly Black and Theo Black (Holly is the author of TITHE and THE SPIDERWICK CHRONICLES, and Theo is an artist who designs drool-worthy websites like that of Melissa Marr). I got to say hello to Gordon Van Gelder (the Magazine of Fantasy and Science Fiction), Lucienne Diver (agent at Spectrum Literary Agency), Rachel Vater (agent at Lowenstein and Yost), Steve Saffel (Del Rey editor), Stanley Schmidt (Analog magazine), Diane Turnshek (SFWA Eastern Regional Director), Carol Burrell (of Children's Book Council), and lots of really cool writers. My only regret is that I never really got a chance to chat for more than 30 seconds with Keith DeCandido and Terri Osborne, authors who I've known for years now, having met at various conventions. Every time I was milling, they were swilling, and when I was swilling ... well you see where this is going. Next time. Anyway, the point of all this name-dropping is: I didn't turn and bolt. It was terrifying when I walked in the door and saw no one I knew, but I stayed and it was fabulous. Guess that's the moral of not just this post but my entire blog: if something matters to you, don't turn and bolt. Stay. Just stay. Do you love fairy tales, myths, and legends? Do you love books that are based on these classic stories? Do you wish there was someplace on the internet you could go to chat about these stories and their retellings with the retellers themselves? If so*, then look no further. This week saw the birth of a brand new livejournal community devoted to classic stories re-told. "Re_Mused is a community of professional writers whose work includes retelling classic stories: fairy tales, myths, legends, and more." Anyway, I was so excited to join this group. And so I did! And now I'm a Re_Mused Writer! The group currently has 13 members and is open for more. So if you write stories based on fairy tales, myths, legends, etc., please come join us. If you don't write retellings but do like to read them, please come hang out with us. Looks like this is going to be a lot of fun. Come check us out! There's still time to nominate books for the Cybils! Nominations are open until November 20th! Imaginary Person Asks: Um, what are you talking about? Imaginary Person: Do you mean the oracular seeresses of the Ancient Near East and Mediterranean??? Me: No, no, no. That's the sybils. I'm talking about the Cybils!!! Cybils = the Children's and YA Bloggers' Literary Awards. It's a brand new award created by a group of fabulous kidlit bloggers. The awards will be given out in eight categories: fantasy and science fiction, fiction picture books, nonfiction picture books, middle grade fiction, YA fiction, middle grade and YA nonfiction, poetry, and graphic novels. Here's a link to the Cybils website itself. And here's a link to a Publisher's Weekly article about the Cybils. And here's a link to the song Personal Penguin, which is mentioned in a totally unrelated article about a Sandra Boynton board book that just happens to appear on the same page of Publisher's Weekly as the article about the Cybils. I'll wait here while you go dance to the penguin song. Anyway, to nominate a book for the Fantasy and Science Fiction category, click here. Main rules are: the book needs to have been published in English in 2006, and you can only nominate one book per category. The winners will be announced in early February. Only a few days left! So get nominating! 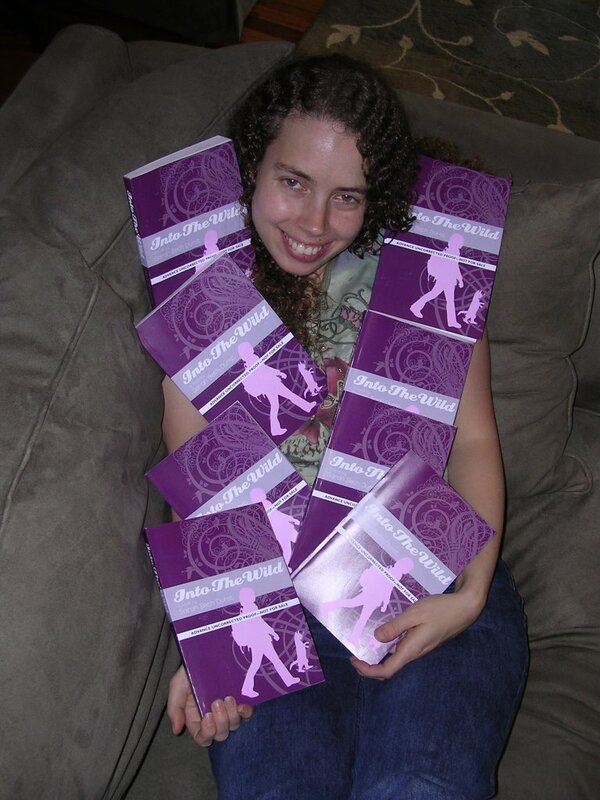 I am about to let you in on one of the best-kept secrets of publishing: the stuff you get after you sign your contract. First and foremost, there's access to the private jet. 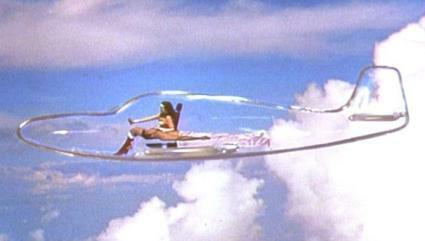 Technically, it's for use by all writers, published or not, but the trick is that it's an invisible jet (modeled after Wonder Woman's) and it's only after you sign your contract that you're sent a copy of the invisible keys and a map to find the invisible runway. I haven't had a chance to use the jet yet, partially because it's been in use pretty continuously since I signed -- first Justine Larbalestier and Scott Westerfeld used it to fly to Australia and then Sam Enthoven claimed it to return to the UK after World Fantasy Convention -- and partially because I keep losing the keys. And if you write for teens and live near Manhattan, you also get invited to Teen Author Drinks Night (TADN), where you are introduced to a fabulous collection of YA/MG writers and a marvelous concoction called vodka pizza. The latest TADN was last night, and I had a great time. Vodka pizza is not, as the name implies, alcoholic. Ever had penne alla vodka? Vodka pizza is regular pizza but made with vodka sauce instead of plain old marinara sauce. And it is delicious. I first tried it last month, the first time I attended TADN, but I was afraid if I told you about it, I wouldn't be invited back. Now that I've been twice, I feel safer telling you (though I am still taking a risk here so I hope you appreciate it). 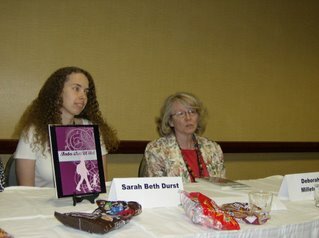 As to the fabulous collection of YA/MG writers, this time I got to chat with... yes, here comes the name-dropping... Coe Booth (author of TYRELL), Erin Downing (author of DANCING QUEEN), Sarah Darer Littman (author of CONFESSIONS OF A CLOSET CATHOLIC), Bennett Madison (author of LULU DARK CAN SEE THROUGH WALLS), Leslie Margolis (author of FIX), Lauren Mechling (author of THE RISE AND FALL OF A 10TH GRADE SOCIAL CLIMBER), Adrienne Vrettos (author of SKIN), and Robin Wasserman (author of WRATH). Everyone was super-nice. Can't wait for next month! A couple days ago, I went into the big city (again) for some meetings with Razorbill/Penguin folks and to have lunch with my wonderful editor. (It's quite clear that I'm still a total newbie at all this because I can't help but get a big grin across my face upon even thinking those words ... lunch with MY editor ...) Anyway, lunch was delicious and the meetings went really well, but the highlight of my visit came when Ms. Editor handed me a big stack of galleys for INTO THE WILD. Yes, you heard me right: I've got GALLEYS!!! I regret only that I don't have more copies. If I did, I'd fill up my bedroom and swim through them! Non-Existent Person Asks: Sarah, since you've been in so many planes, trains, and automobiles lately, I bet you got to do a lot of reading. Read anything good? Sarah Answers: Hello, imaginary blog reader! Nice to see you here again. 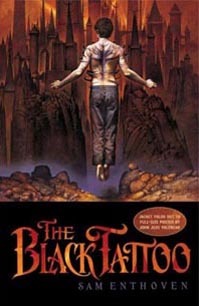 On the way down to the World Fantasy Convention (WFC) in Austin, I read THE BLACK TATTOO by Sam Enthoven, a fellow Razorbill author. It's about a 14-year-old boy without a shred of magic who has to outsmart all the demons of Hell in order to save himself, his friend, and oh, pretty much the entire universe. Very cool. Great pacing, inventive storyline, and a fun sense of humor. I gobbled it up. And now for the highlight of my WFC trip -- my reading -- my very first reading from INTO THE WILD -- my very first reading ever! I was soooo nervous. In the days leading up to the convention, I practiced at home by reading out loud to my cat. She heckled. This was not encouraging. Nevertheless, as part of the Young Adult Reading at WFC, I read the beginning of chapter ten of INTO THE WILD to a very kind audience of about two dozen people. Oh my, wow, it was such a high. The reading itself was the brainchild of Tiffany Trent, the matching bracelets for the four readers were created by Jo Whittemore, and the chocolate for the audience ... yeah, that was my contribution. (See my prior post about the role of chocolate in writing.) The audience was composed of primarily strangers, but I did know a few people: Sam Enthoven, John Joseph Adams, Jeri Smith-Ready, Mark Williams, Faith Stencel, Clover Autrey, and Heather. I swear I didn't twist their arms (much) to come. The room was set up the same way I'd seen for a hundred other convention readings: long white table at one end and rows of those standard-issue gray conference chairs. I know those chairs well, but this was my first up-close-and-personal experience with the Long White Table. Did you know that the skirt doesn't go all the way around? And it's surprisingly light to lift. Ahh, the secrets that are revealed to program participants! 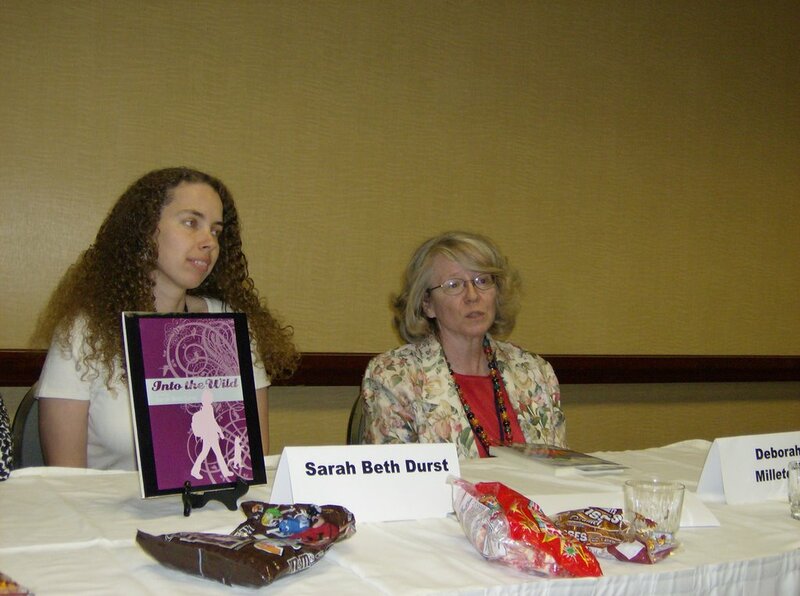 But seriously, it was damn cool to sit facing the audience and put up the official table tent with SARAH BETH DURST on it in front of me. Also in front of me, I put an 8x10 photo of my cover art, which my glorious husband had mounted on foam board. He gets very excited about these sorts of arts and crafts projects. Though he did a bit of swearing when he accidentally stuck the photo to the wrong part of the foam board, his little project turned out great in the end, and it was nice to be able to display my cover art as I read. Check out these pictures of the four of us, stolen from the blog of Faith Stencel. Thanks, Faith! I'd love to share with you my feelings upon reading my own words to an audience for the first time, but the words seem inadequate... Fun. Empowering. Kind of like flying. People laughed at my jokes. They applauded at the end. They didn't throw tomatoes. Or even candy. They said very nice things afterwards. And I felt like I could fly. After everyone read, we had a Q&A. Mark Williams broke the ice by asking the first question -- thank you, Mark! The second question was just to me and was from a total stranger. (I swear! I didn't bribe her! Unless you count the candy...) We answered a few more questions, and then it was over. I didn't know it would feel so awesome. Can't wait to do it again! I'm still in Austin, having a fabulous time at World Fantasy Convention -- stay tuned for more about WFC -- but I just had to tell you about some really cool news. My editor just emailed me to say that Tamora Pierce has submitted her blurb for INTO THE WILD. Yes, for those of you who missed my earlier post about this, Tamora Pierce -- my all-time favorite author -- was wonderful enough to agree to write a blurb for my book! And now she's finished reading my book! 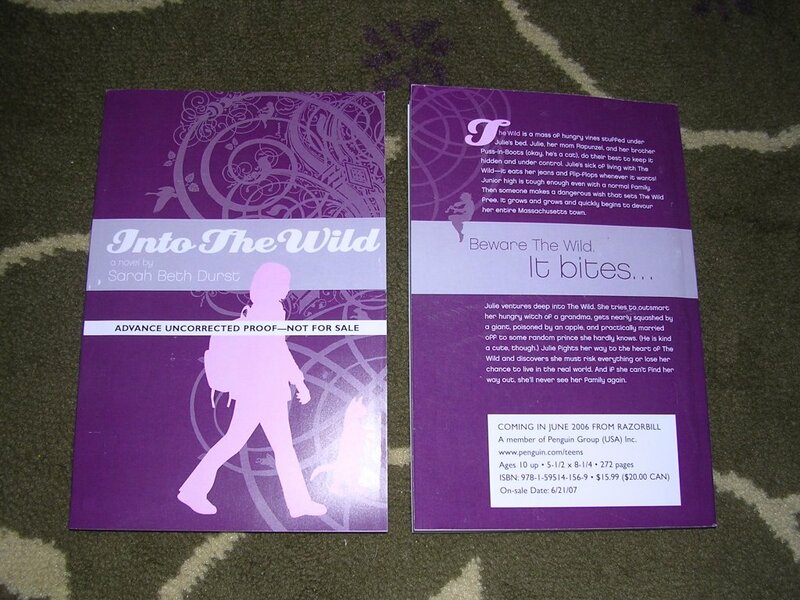 And she wrote a blurb! And here it is!!!!!!!!!!! Eeeeeeeeeeeeeeeee!!!!!! How awesome is that?! I just had to blog about it. And plaster it all over my website! And tattoo it across my forehead... OK, not that last one, but as you can see, I'm rather excited about this. I can't wait to see how it looks on the finished book. OK, back to the convention for me. I promise to give a full report on WFC after I get back. P.S. - I just learned that Tamora Pierce's latest book, TERRIER, just debuted at #2 on the NY Times Children's Chapterbook Bestseller List. Yay! Congrats, Tammy! This Thursday, I'm heading to Austin, Texas, for the 2006 World Fantasy Convention (WFC). For those of you picturing lots of Klingons (not that there's anything wrong with that)... WFC is a book-oriented professional conference where fantasy writers, editors, agents, and readers gather to discuss both adult and young adult fantasy literature. I love this convention. I've been attending as an aspiring writer for several years now. In my opinion, it's one of the best conventions out there, mostly due to the high percentage of professional writers, editors, and agents who attend. Over the years, I've had the chance to listen to a lot of great panels and readings, meet a lot of fabulous people, and learn a lot about the craft and the industry. This is the first year that I get to attend as a professional writer. For the first time ever, I can introduce myself as a published writer! I can tell people about my book! I can hand out my snazzy new business cards! where I will be doing my very first reading from INTO THE WILD!!! 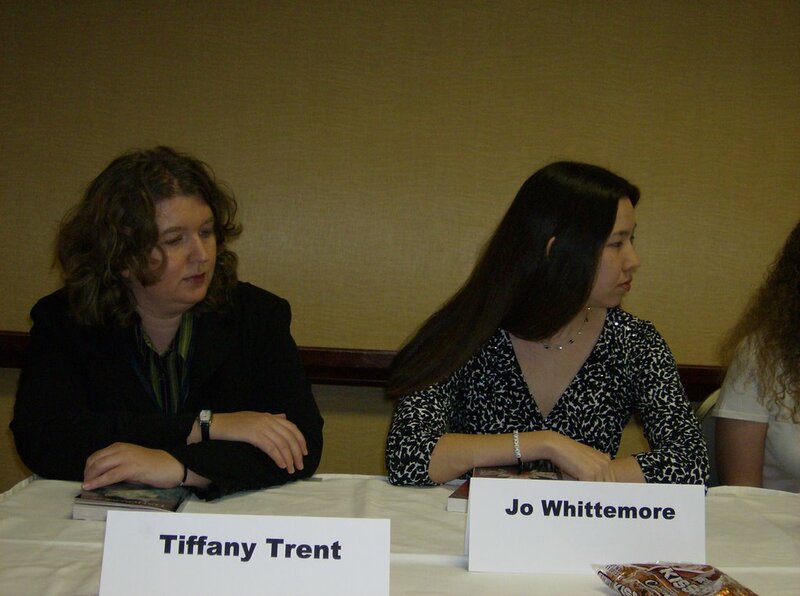 And I'm so glad that I get to read alongside these three fabulous authors: Tiffany Trent and Jo Whittemore, who I already know, and Deborah Millitello, who I'm looking forward to meeting. This should really be a lot of fun. Plus, as a program participant, I will have my name and book listed in the Program Guide for everyone to see. I will get a ribbon on my nametag that says "participant" or something like that. And I will get access to what's known as the "Green Room." Every convention has a Green Room. This is a special room designated for program participants only. I am told that all Green Rooms are painted emerald green with actual emeralds studding the ceiling. By law, every Green Room must have at least one chocolate fountain, one raspberry-sauce fountain, and one Fountain of Youth. In the Green Room at World Fantasy Convention, program participants can choose to chat with the ghosts of late literary giants, ride telepathic dragons, or experiment with time travel. Every program participant also gets their very own miniature griffin to take home. If you're attending WFC, I hope you'll come to my reading. If you promise not to heckle, I'll even let you play with the griffin.